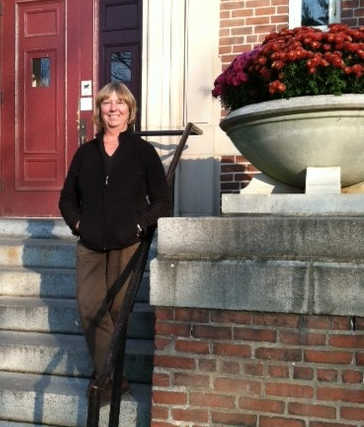 I met with Ellen Weeks at French Hall, one of the wonderful older buildings on the University of Massachusetts campus. Ellen trained as a Master Gardener back in the 1980s when UMass ran the program and has been an active gardener since her teens. Her mantra is "just grow it!" My father's family was from the Azores, and I think all my relatives on that side had gardens. They had sort of a friendly competition that I never witnessed but heard referred to. My grandmother had a little garden at her house, and I just grew up around it. I would go out there and pick parsley. There was something about it that was just appealing. The ideas are certainly planted by the adults. By the time I was sixteen I decided I wanted to have a garden. There was this wood lot right over a stone wall near our boundary, and nobody ever did anything with it. So I cleared a bit away and planted some tomatoes. I was growing tomatoes in the shade. What did I know! Just get out there and do it. You went to the University of Rhode Island. What did you study? My degree was in Agricultural and Resource Technology. This was their Plant Science degree sans Organic Chemistry that I couldn't fit into my schedule. So my degree is in Horticulture. I had originally started out thinking I wanted to go into Botany, but after my first Botany class, I realized that it was too research-oriented and too teaching-oriented. I wanted the hands-on stuff. So I gravitated to the Plant Science department to get into Horticulture. URI was smaller. It was in-state. It was a good fit. And then you went to the Shaker Village in Hancock? That was my first job out of college. The country was in the 1970s recession, and jobs were scarce. I was thinking of going into the Peace Corps. Then I met this woman from the Shaker Village through a talk at the URI Plant Club. I asked her if she thought they might have any jobs, and she told me she was going to a job in Hong Kong, and they needed a replacement. So I went up there on a grey, snowy, rainy April day thinking that I was going up to the Indian territories (it was so far from home.) They gave me the job! I got an apartment, really a room with kitchen privileges on the grounds, because they were a museum and paid the agricultural minimum wage of $1.65 per hour. There were herb gardens that were the pet project of Amy Bess Miller who was the President of the Village. The whole project had been her baby. The Shakers had sold the property in 1960, and it was about 1,500 acres. There were various ideas in mind to develop it. Amy Bess was one of the Pittsfield 500. Her husband was the Berkshire Eagle publisher. She did some fundraising with her friends, and they bought the property to turn it into a museum. Herbs were starting to become popular and were one of the big businesses for the Shakers. So the museum started ten 100 foot beds, demonstration gardens with all the different herbs the Shakers grew. My job was to take care of them. Keep them looking good and conduct workshops for the public about things you could do with herbs. This was before you could buy unusual herbs in any CVS or grocery store. We grew both culinary and medicinal herbs. In the 19th century there were all sorts of people selling herbal preparations, but there was no quality control. So people never really knew what they were getting. The Shakers had a good reputation for purity. Whatever it said on the package, you could feel secure that's what it was. A significant percentage of their business was medicinal herbs. That was a fun job because I was the lone horticulturalist in this world of museum people. They were all about the buildings and the artifacts. I worked there for five seasons, with a year in between to work for Bear Meadow Herb Farm up on Florida Mountain. After Shaker Village, I got a job working for a flower shop for nine years. I liked it because it was very creative. You had to think on your feet all the time. It could be very challenging that way. How did you come to work at UMass? I got a flyer in the mail after taking the Master Gardener program. UMass was advertising for scouts to work for the Extension Service's Landscape Message Project. The way that works is that they have scouts in different parts of the state that check key plants and see what's happening with insects, diseases, etc., and then report. That job was filled by an in-house person and left another position vacant. This is the job I have now. That was 22 years ago. That was three years after Extension Services were cut, and a lot of people were let go. A lot of programming had to be eliminated. How did the Master Gardener's get involved in taking over some of the services provided by Extension Services? In the 1970s, the country had transitioned away from agriculture as a thing that most people did for a living. Most peoples' experience became backyard vegetable gardens, gardens in general, and the whole growth of suburban landscapes. Extension was organized in 1914 as a way to bridge the gap between the research at the land grant colleges and universities and the public. At that time it was working with farmers and with homemakers who were doing food preservation. So here we have evolved 100 years later. We have become a suburban society. People are gardening in their backyards but they are not farming for a living. But this whole system of county agents was still in place. And so those county agents were now receiving requests for information from the public about "how do I plant this?" "I've got this bug, what do I do?" One of the Extension offices out in Washington state had the idea of training volunteers who would come in and do triage, answer the easy questions, and help people. It spread to a national thing where every state Extension started their own master gardener program where they would train volunteers to answer questions in the county offices to take the pressure off of the county agents. Ron Kujawski was instrumental in getting that going here in Massachusetts. They began with something in the 70's called Extension Gardeners, but that didn't last long. It went dormant for a while and then Ron suggested it be revived in the early 80s. So Extension started the Master Gardener program. We basically still use their model of running a 60-hour class, and then asking trainees put in a minimum of 60 hours of volunteer work. Back then it was just to work in the county offices to help the county agents. They did that until the budget cuts in 1989, and the home gardener program was discontinued, and the master gardener program along with it. All the master gardeners that they trained for the last seven years were still active and were committed to the program, and they thought it should be continued. That evolved into a nonprofit 501(c)3 organization with a board of directors and a charter. That took two or three years to get in the works. And you've been involved with the training course? I was involved with the training from the beginning. We had this organization now, but we had a finite membership. People's lives change, and it started getting smaller. We had to decide what we were going to do to grow the organization and keep active. I suggested there was no reason why we couldn't do the training ourselves. It sort of became my baby. We used the model Extension had been using. It's evolved over 20 years as far as the emphasis. Some things have stayed the same, and some have changed. I use my contacts with Extension to help get speakers. A lot of other states have a training manual. We tried Maine's, then Cornell's but found them to be a little out of sync with our climate. URI's seems to be a good fit, and it has an over-arching theme of sustainable landscapes. I was about to graduate from URI and wanted to take the course there, but I moved to the Berkshires for my job. So I missed that opportunity, but tucked it away in my mind. By the 1980's I was working for the flower shop, which was seasonal, and the timing was right. The classes were in Florence once a week in the winter. There were five of us carpooling so it helped to reinforce the learning. You've served MG in a number of capacities. What do you think is the most important thing that the organization does? I think in a lot of ways we are still trying to find out who we are and settle into our niche. We used to have a very defined role, and now that we don't really have that focal point. Because the members have such a diverse array of interests, the organization has scattered in several directions. So the challenge has been to continue to pull people in to feel connected and operate as part of a whole. Yes, do your different projects but still consider yourself part of the Master Gardeners rather than someone who is doing this project who happens to be a MG. The availability of the Internet has made it possible for a lot of people to figure out the answers to their questions on their own. So I think the biggest role we play is for people who are new to gardening and want to try it, but it just seems too intimidating because they read so much and hear so much that they don't know where to start. They don't want to put a foot wrong and don't want to waste their time, their energy and their money. So they basically say "what do I do?" In some ways, we act as mentors to those people to help them get started and just say "don't worry; don't be afraid. Just go plant something. Here are some of the pitfalls." So I guess I see that as our biggest impact on people. If I have a legacy to give to the MG it would be to get them back into the Extension fold and help them get reincorporated back into the mission they were created for. We'll see. We had a very small crack in the door this past year by getting the OK for MG’s to come into the Extension office here on campus to answer home gardener questions. That was the first time in 25 years that they did that. What do you see as the future of the MGs? The need for the public to obtain impartial information has not gone away. During the season, we still get inundated with questions, and that is what I'd like to see: Master Gardeners answering questions from the public in a volunteer capacity and taking the pressure off the people at the University. Just because there is a ton of information available online doesn't mean the average person knows how to vet what they read for accuracy. Plus there has been a huge resurgence of interest in gardening with the economic downturn. And the younger generation feels that this may be a way to help save the planet. There has to be a shift in how people live their lives, and this is one way they can live more lightly on the planet. This is very much like what happened during the back to earth movement during the 1970s. It will be interesting to see if they can sustain that ideal. What have you enjoyed the most about being a master gardener and your work at the University? What I have enjoyed the most about the MG organization are the people. They are the nicest, most interesting group of people I've ever been involved with. What I like the most about my job is my contact with people in the agricultural and horticultural worlds. It's a very stimulating workplace that way. Tell me about your trip to Iceland. What did you see? That was a geology trip. They don't do a lot of farming in Iceland. Most of their food is imported. What we saw was a greenhouse operation, and because they have abundant, cheap, thermal heat, they can run these greenhouses. This operation was growing greenhouse tomatoes, and it was the only operation I think there was. The heat for the greenhouses was cheap. They had circulating hot water, and they had halogen lights. Electricity is cheap; they generate their own in Iceland from thermal energy. If they didn't have the thermal, it would have been prohibitively expensive. They were doing bio-control. They had boxes of bees throughout the greenhouses. They were acting as pollinators. It was a hydroponic system. They were putting nutrients into the irrigation system. It was a week-and-a-half trip looking at volcanoes and glaciers. It was fascinating! I highly recommend it, it's only five hours by plane from Boston. The people are wonderful. It's an easy place to get around, though not cheap. What about your own garden? It's a big weed patch! I am far more ambitious than I have time to do justice by. When my husband and I bought this property in 1999 we were going try to grow as much food on our own as we could. Every spring I start my seedlings in the kitchen in March and by July the garden has gotten out of hand. I always have enough food but it probably is not as productive as it could be. I have to remind myself that it is summertime, go play, too. I've started decreasing the amount of garden area just because in another fifteen years I may age out of wanting to do that much maintenance. So I am trying to figure out how to transition it to be still a nice landscape and have the things I want without it being such high maintenance. I have one vegetable garden about 30'x 40' and another about 20'x30' plus several other gardens that are perennial beds. I try to take out the worst of the weeds and move around the flowers that are being overrun. It’s pretty much survival of the fittest. Whatever comes up is good! My plants have always been shared plants from friends and plant sales. It's not like I've got a specimen garden. I've never had much of a design sense. So I do it by trial and error. I end up moving plants around because after a year or two if I find it didn't work there, I'll try it elsewhere. Do you do any food preservation? I used to do canning and then I inherited a freezer. But over then last ten years there have been all these disasters where people around me have been without power for days or weeks. So I've slowly started canning again. I feel comfortable canning tomatoes, pickles, and fruit. But I want to start doing more of it. The problem with canning is that you have to do it when the conditions are the least conducive to having vats of boiling water in your kitchen. The temperature is in the 90s and the humidity is in the 90s, and then you're going to boil water? But there are several things that I can provide a year's supply on my own, like tomatoes, peppers, onions, garlic, string beans and broccoli. That's a very good feeling. Plus I still dry some herbs like I used to do at the Shaker Village. Whatever gets people to go out there and grow plants, that's fine with me. Just grow them! It gives you a sense that despite whatever turmoil that is going on in the world around us, there is continuity in the natural world that will continue with or without us. But to get an understanding into how it works, I find very reassuring. The workings of the universe are moving along just fine without any help from us. How can you not love a weed that can germinate in a crevice in a concrete sidewalk and grow, survive, and do well?